Although a wide range of mathematical techniques can apply to solving problems involving the interaction of waves with structures, few texts discuss those techniques within that context-most often they are presented without reference to any applications. Handbook of Mathematical Techniques for Wave/Structure Interactions brings together some of the most important techniques useful to applied mathematicians and engineers. Each chapter is dedicated to a particular technique, such as eigenfunction expansions, multipoles, integral equations, and Wiener-Hopf methods. Other chapters discuss approximation techniques and variational methods. The authors describe all of the techniques in terms of wave/structure interactions, with most illustrated by application to research problems. They provide detailed explanations of the important steps within the mathematical development, and, where possible, physical interpretations of mathematical results. Handbook of Mathematical Techniques for Wave/Structure Interactions effectively bridges the gap between the heavy computational methods preferred by some engineers and the more mathematical approach favored by others. These techniques provide a powerful means of dealing with wave/structure interactions, are readily applied to relevant problems, and illuminate those problems in a way that neither a purely computational approach nor a straight theoretical treatment can. 8. 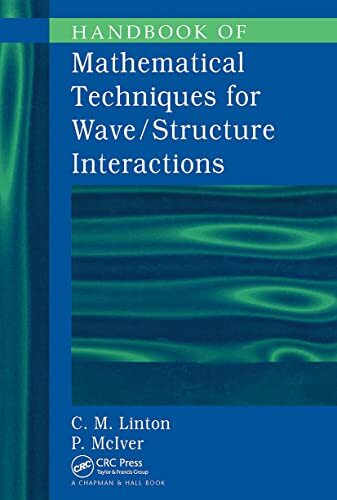 Handbook of Mathematical Techniques for Wave/Structure Interactions [Hardcover] Linton, C.M. and McIver, P.
9. Handbook of Mathematical Techniques for Wave/Structure Interactions [Hardcover] Linton, C.M. and McIver, P.